North Yorkshire possesses some of the most stunning landscapes in Britain, with its spare, sometimes blasted moors, beautiful hills and dales, and a gorgeous coastline. It’s no wonder, then, that it’s become an increasingly popular destination for walkers. It’s also home to the smallest of the our National Parks, with plenty of walks for those who love hiking, ranging from the epic Cleveland Way to the final stages of Wainwright’s coast-to-coast walk that finishes in the dramatic village of Robin Hood’s Bay. The biggest of the walks in North Yorkshire is the Cleveland Way, all 110 miles of it, which opened in 1969. It doesn’t strictly go across the moors, but rather forms a circle around the top of it, beginning in Helmsley and going by Rievaulx Abbey, crossing the very top of the moors, catching the coast at Saltburn and winding down as far as Filey in East Yorkshire. Obviously it’s not a trail to be completed quickly – the average for those attempting it in one go is nine days – but with plenty of different scenery to savour, some of it rough and wild, whilst the craggy coast offers plenty of different communities and a history of the county, ranging from the clifftop majesty of Whitby Abbey to the boggy, beautiful moorland. It’s become one of England’s great walks, a challenge undertaken by thousands every year, although the wildness means it’s very much suited to summer. With a number of places to stay along the route, ranging from the historical to the contemporary, it’s not hugely challenging in the way some walks are – the Pennine Way, for instance. But it offers its own rugged beauty. Alfred Wainwright, best known for his Lakeland walk guides, was also behind the coast-to-coast walk, which originates on the West coast, wending its way over the Pennines, and ending in Robin Hood’s Bay. The final stretch takes in the North Yorks moors, dipping from Richmond to Ingleby Cross, then over the Cleveland Hills, which can offer plenty of challenges, then onto the moors, following an abandoned railway line, leading to the moors and a climb through woodland before finally dropping down to the coast, taking in a few miles along the sea before finishing at the Bay Hotel in Robin Hood’s Bay. 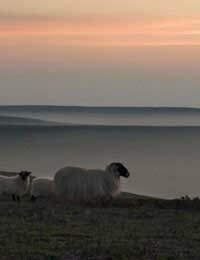 The Lyke Wake Walk is a challenging walk of 40 miles to be completed in 24 hours, crossing the North Yorkshire Moors from close to Osmotherley and finishing close to Ravenscar. It follows the Cleveland Way in part, although there’s actually no official route, just general guidelines. It passes close to the early warning station at Fylingdales before finishing just short of Ravenscar, although many continue into the town itself (it’s just an extra mile). Because of its isolation, monks created a number of abbey’s across the moors, and travelled between them on foot. So they could find their way from one to the others, crosses were erected along the route. They still make excellent signposts for those taking a “pilgrim’s walk” across the moors from abbey to abbey (not to be confused with the Pilgrim’s Way on the North Downs). It’s possible to find your way from York across the moors all the way to Whitby on this kind of northern Pilgrim’s Walk.